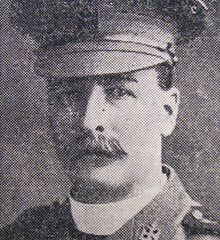 Richard Ussher Greer was born on 29 July 1868 at Riverside, County Tyrone. Richard was the son of the Reverend William Henry and Charlotte Pike. Rev Greer was Rector of Kilcoleman and Crossboyle, County Mayo. Richard was educated at the Royal School Armagh and then the Royal School Dungannon and Trinity College Dublin (1887-93). In 1911 he was appointed Rector of Seapatrick Parish Church, Banbridge. Rev. Greer secured a chaplaincy with the 8th Battalion Royal Irish Rifles (East Belfast Volunteers). While Rev Greer was on a leave of absence from there, that he suffered a brain hemorrhage at home and died suddenly on 23 June 1915. 3 Community Trees Information on Richard Ussher Greer. 4 Forum discussion Mentions Richard not actually getting to France. 5 Raymonds County Down Website Includes images which give a full biography of Richard Ussher Greer.